All levels of riders and horses are welcome to Hillcrest Farm’s training program. Both the serious competitor and the recreational rider will benifit from Jane’s technical knowledge, ability to instill confidence and apply a systematic training program to help you achieve your goals. Lessons are geared towards a fun and positive learning experience for horse and rider while instilling confidence and learning correct and classical methods. School horses are not available but lessons on your horse can be arranged at Hillcrest Farm or your facility. With a strong background in both Eventing and Dressage, Jane can help you progress in your riding or improve your horse in training at any level from beginner to advanced. Contact Jane Stone for information about lessons or training. If you would like to book a clinic in your area please inquire about dates and rates. Check our Bale and Breakfast page if you are considering a combined stay at Hillcrest Farm B&B with your horse. We would be happy to arrange a lesson/clinic weekend for you and your horse. 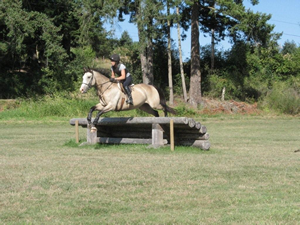 Jane learned to ride at the age of 4 and began Eventing with the Cowichan Pony Club at age 11. After Eventing in western Canada for her junior years Jane spent two seasons competing in eastern Canada and the US and was long-listed to the Canadian Team in 1981. She competed at Intermediate and Advanced level at major Canadian Equestrian Team selection trials in Canada and the US. Jane continues to compete in Horse Trials and Dressage shows in BC, bringing along young horses for resale. Her current mount ‘Pesto’ is a 11 year old home bred Canadian Sport Horse who is persuing a career in Dressage, currently competing at Intermediare 1. After starting with the Equine Canada coaching certification program Level 1 in 1976, Jane continued to build on her qualifications with Level 2 and then attained her Level 3 Eventing Coach status in 2002. Jane has spent several years on the Canadian Eventing Coaching Committee. Jane has attended many coaching clinics and seminars with elite coaches such as Stephen Clarke, Jimmy Wofford, David O’Connor, George Morris, Leslie Law and Jack LeGoff. Jane currently coaches competitive and recreational riders of all levels both on the farm and away, often travelling throughout BC, Alberta and the Pacific Northwest doing clinics. While her clients ride at all levels, some have ridden at the Intermediate level and several have ridden on NAYR teams. Jane coached the Canadian Pony Club team in New Zealand in 2001 for the Inter-Pacific Rally and has also coached the BC team at the Can-Am Challenge several times.